With an increase in the number of preschools, almost at every corner of the lane many schools are facing problems due to tough competition. We as franchise believe to provide an extended support with the fact that with the resources at the disposal, the branded school chains shall be able to heavily invest in Research & Development, develop "best practices" and also market their brands much better than what a standalone school can do. Parents see this and therefore choose "brands" over single unit schools. Also, you must be aware that all things remaining the same, people are always ready to pay more for a branded product. Therefore, it would be advantageous for you to join hands with SHANNEN KID'S and upgrade your school to the highest standards in the country. 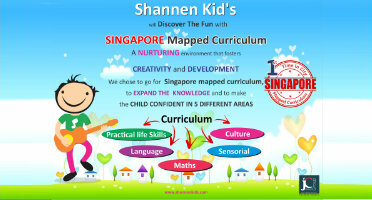 By joining hands with SHANNEN KID'S, you will definitely see the difference with the increase in number of inquiries and admissions. At the same time we offer more and charge less as we provide a no royalty package. Hence, the system, academics, consultancy virtually comes free!! So, contact us and see your school rise in the popularity charts in the city. We can assure you that in the next few years, your SHANNEN KID'S Futuristic School will be one of the most sought after schools in your region!